Figure 2.3 (a) A schematic representation of a typical rhodopsin-like GPCR. 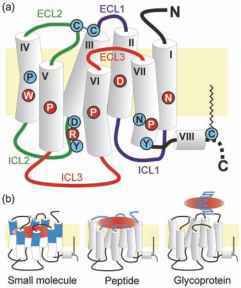 The transmembrane helices (I-VII) are arranged counterclockwise (viewed from the extracellular side), beginning with the extracellular N-terminus and including three extracellular and intracellular loops (ECL, ICL). There are invariant amino acids in each transmembrane domain (white on red) that provide a reference point for all rhodopsin-like receptors in the Ballesteros-Weinstein numbering system (X.50). Other highly conserved motifs mentioned in the text are also indicated (black on blue). (b) Different modes of binding for rhodopsin-like GPCRs are summarized by the binding "pockets" occupied by different sizes of agonist (red) and the broad regions of receptor involved in ligand interaction (blue). Figure 2.4 (a) Othosteric and allosteric ligands at class C GPCRs. Orthosteric agonists bind and close the N-terminal Venus Fly trap (VFT) domain, connected to the hepta-helical bundle (7TM) via the cysteine -rich domain (CRD). Orthosteric antagonists interact with the same VFT site but prevent agonist occupancy and VFT closure, preventing receptor activation. In contrast, allosteric class C GPCR ligands bind to a separate intramembrane pocket within the 7TM bundle, and may influence receptor function in conjunction with orthosteric ligands and/or independently. (b) A comparison of the key transmembrane residues (white on black) forming the orthosteric site of the P2-adrenoceptor (for adrenaline; ) and the allosteric site for the modulator MPEP at the mGluR5 receptor (rat sequence; ). Conserved TM residues (squares) for family A receptors (see Fig. 2.3a) and family C GPCRs are also indicated. 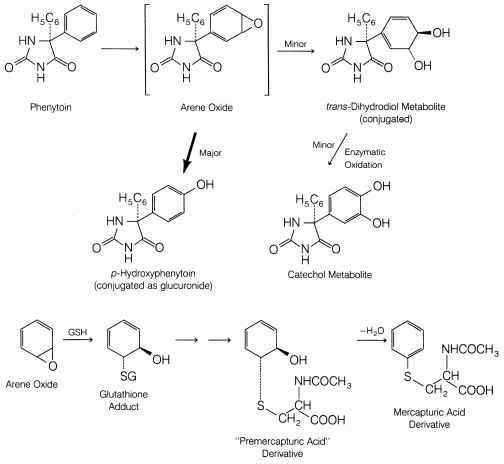 aspartate residue recognizes the agonist amine in all acetylcholine, adrenaline, dopamine, histamine, and 5-HT receptors. Thus, while the compact binding space of these receptors has historically proved most tractable for drug discovery, there are limitations to the selectivity that can be achieved when targeting only the orthosteric binding site. An intramembrane binding pocket also forms the predominant recognition domain for a few peptide GPCRs, particularly for smaller ligands such as Angiotensin II at the ATI receptor - 42] . Invariably, larger peptides require binding epitopes on the extracellular surface of the receptor (Fig. 2.3b). For example, neuropeptide Y binding to the Y1 receptor represents a halfway house, in which the C-terminal end of the peptide agonist inserts superficially into the helix bundle pocket while the majority of the agonist contacts ECL residues . It is also clear that peptides can act as agonists even if they only bind the extracellular domains. The relatively small 10 amino acid peptide substance P is recognized exclusively by motifs in the N-terminus and ECLs of the NK1 receptor [44-46]. Indeed, intramembrane residues first described as direct participants in substance P binding now appear to prevent general receptor conformational changes associated with agonism, at a site distal to the binding domain . For the protease-activated receptors, a tethered peptide agonist (6 amino acids) is revealed by enzymatic cleavage of the receptor N-terminus and binds only ECL 2 . The largest glycoprotein hormones (e.g., follicle-stimulating hormone [FSH]) use a large N-2erminal domain in their receptors for high-affinity interaction (Fig. 2.3b)  . The FSH receptor binding surface is formed by a concave leucine rich repeat, which has been studied by crystallography of the N-terminal ectodomain in complex with the hormone . The mechanisms by which glycoprotein binding elicits receptor activation are still open to debate. One model suggests that once associated with the N-terminus, the hormone is presented to other recognition epitopes in the receptor extracellular or TM domains. This model shares features with the proposed mode of binding for class B GPCRs, a select group of peptide receptors which are also distinguished by a large structured N-terminal binding domain - 50] . It is also possible that the N-2erminal binding site is the only direct interaction between the protein hormone and the receptor. 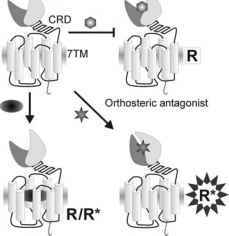 In this case, the resultant changes in this ectodomain (particularly in the hinge region at the junction with TM1) may either directly lead to receptor activation, or remove the inhibitory constraints suppressing constitutive activity .